Comiket 92 will be held from August 11th to 13th, 2017. The first day is dedicated for Touhou only. I’ve been so unproductive during Reitaisai 14. It’s a good event with high quality music anyway, but the number of my translations doesn’t increase much. This event, I’ll compensate for my laziness. Summer Comiket is the best event in the year! In this post I might introduce works besides music. It’s the grand event of the year so I’ve tried to make things a little bit different and unique. I chose to write this post very quite long. You could say I’m mostly ‘rambling’. I might go off-topic somewhere in this post. Please try to stick with it because I’m hyped up! Pizuya’s album in RTS14 is very good to listen. However, this time, they return with a RenMari album! Crossfade for スタンドアロン is so amazing! The first track PV has been released in the Nico Nico Fes previously. If I listened correctly, the fourth track is an English track. It’s great to learn more about Futoumeido’s talent. Pizuya’s arrangement in this album is quite spot-on. I really look forward to the full instrumental version of NOiSE -ノイズ-. The second one is a good piano album I’d suggest. I’ve listened to some instrumental arrangements from pizuya before, but I don’t remember it so well. Maybe I’ll go with this one. The piano itself has a calm and clear melody. I think there is a little bit of ‘pizuya’ somewhere in the crossfades. That’s how I feel. For the third one, pizuya decided to go with two RenMari albums. We have three guest vocalists in the album. めらみぽっぷ, あやぴんず* (from Shinra Bansho) and あまね at “COOL&CREATE”. The crossfade is good. There is a second PV accompanied with the first track – 月面トキメキツアー. The second and third track shared the same original theme with the first one! Merami’s voice in the third one is great! I personal like the arrangement slightly better than the singing. And Yuuhei decided to boost Toa’s name in the bonus CD. 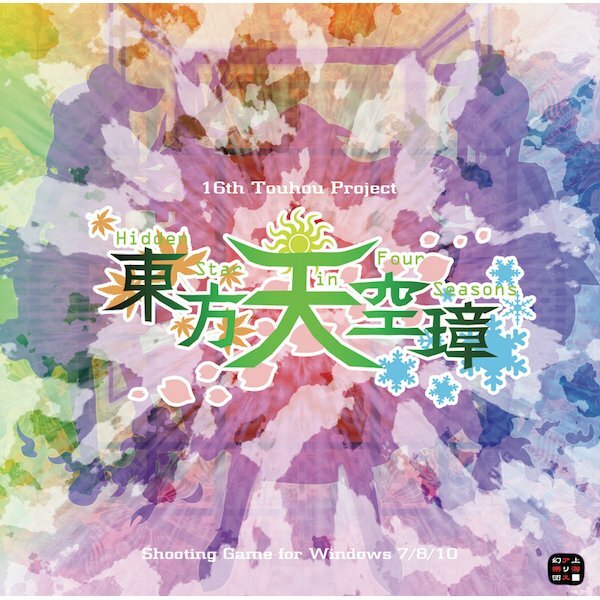 It contains Toa’s cover versions of 造花であろうとした者; 泡沫、哀のまほろば and 零れ桜. They are the highlight tracks from Yuuhei in the past, so it would attract the fans to discover the new vocalist easier. 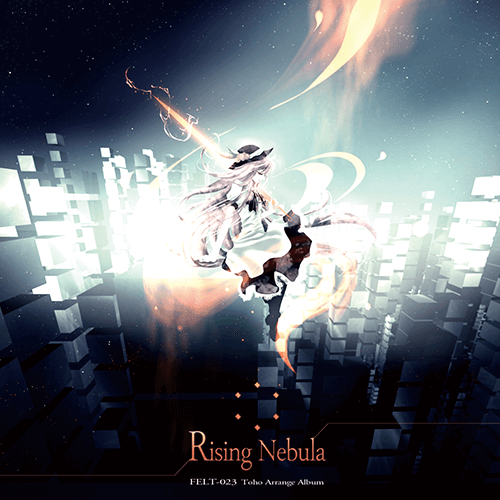 The bonus CD also contains the Shoujo Fractal orchestral cover of 月に叢雲華に風. 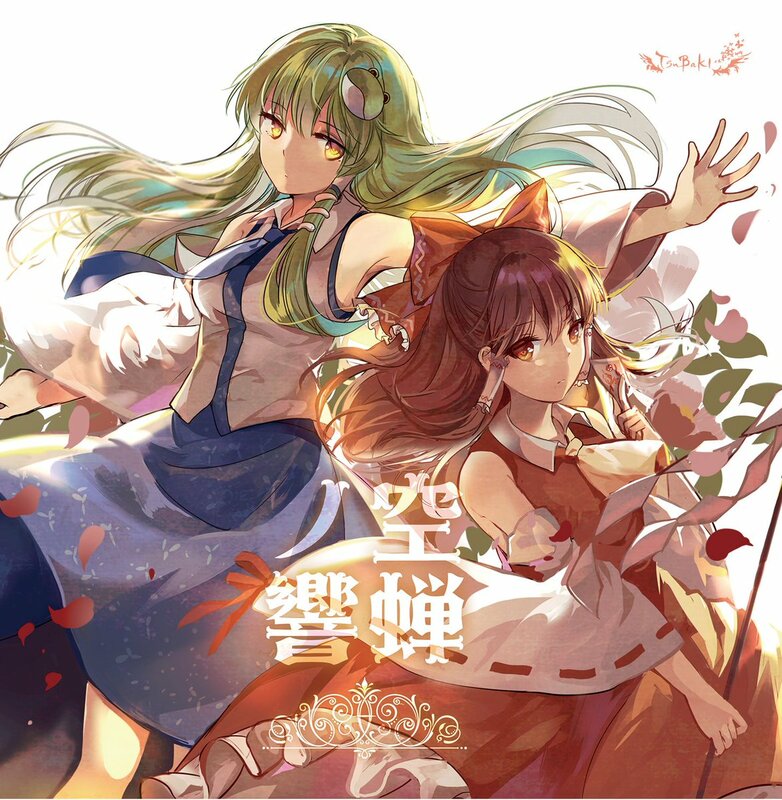 For Shoujo Fractal, the CD jacket was illustrated by c7肘 (also known as kieta), featuring the Illusionary Barrier Team – Reimu and Yukari! The Reisen’s track is very catchy to hear. 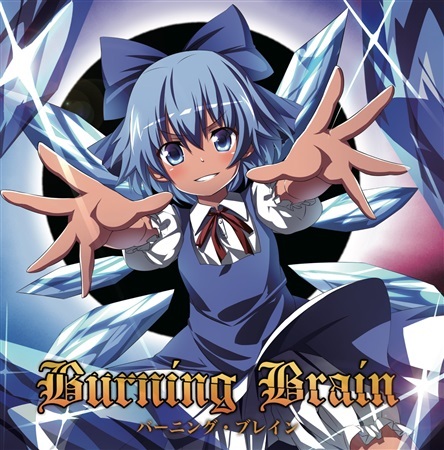 This album features a cover version of 瞳に隠された想ヒ. The original track from Okuyama Namari would be a great one to listen. This Fractal album doesn’t have many of my favorite original themes, but it’ll be okay to me. This is my first time approached a collaboration album between TUMENECO and GET IN THE RING. More duets songs are coming~~! yukina and Mie are one of the best duets in Touhou doujin music. 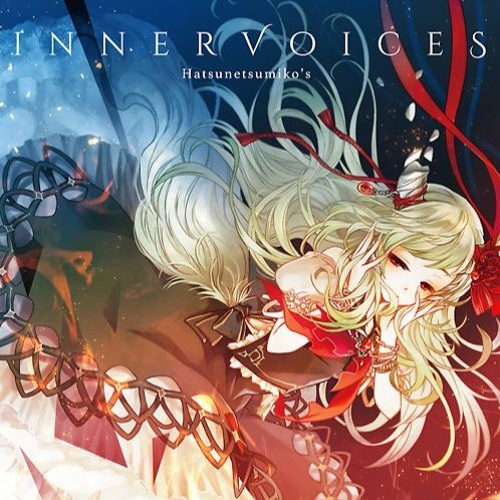 Like, Mie’s voice can go with anyone, Merami, Ranko, Ciel,… There are some remixes in this album I found it nice. 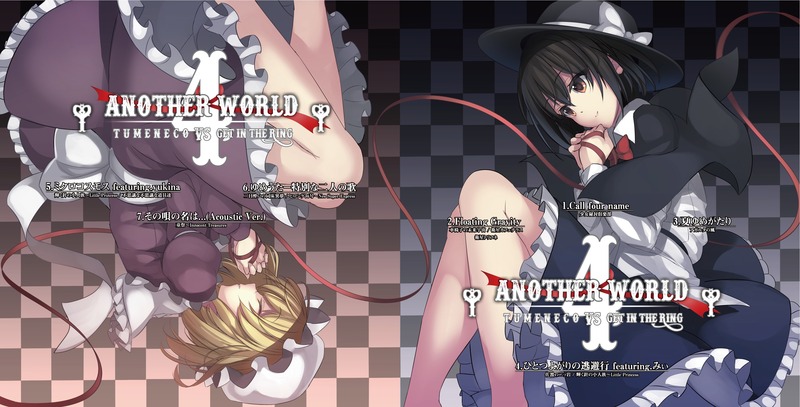 I’ll take a look at the previous “Another World” to see how the forth volume would go. I’ll keep up to Touhou Nekokenban album from Paprika. I listened to the previous volumes before. This album theme is inspired by RPG style. According to the message in the official site, the scans will include some recipes… Recipes, um, for what…? 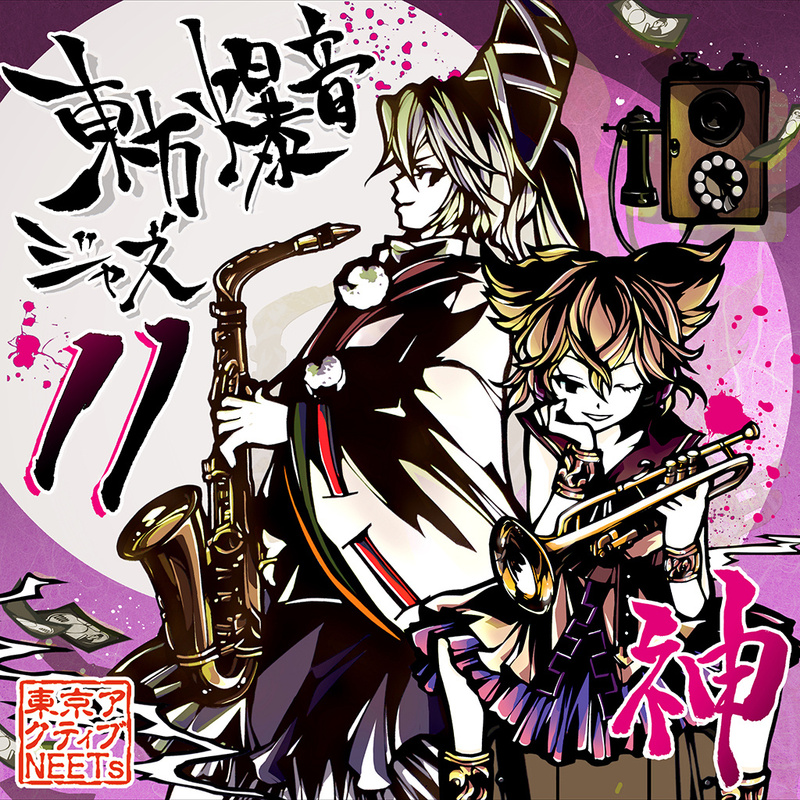 Touhou Nekokenban is a nice instrumental album. It matches my taste for piano instrumental. The album’s jacket is bizarre as always. But that’s how Paprika keeps his uniqueness. It’s cute for me. 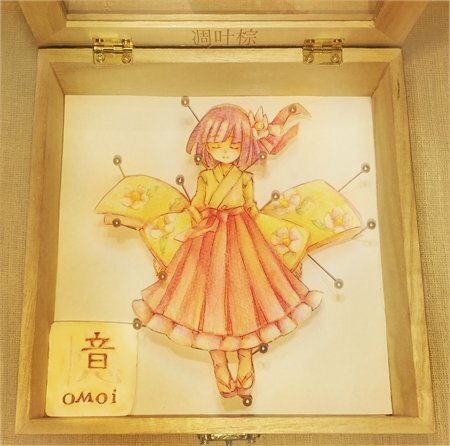 Thier RTS14 album – 桜花ノ下 – was a decent album to enjoy. Only five tracks but deliever quite much. So does this one. 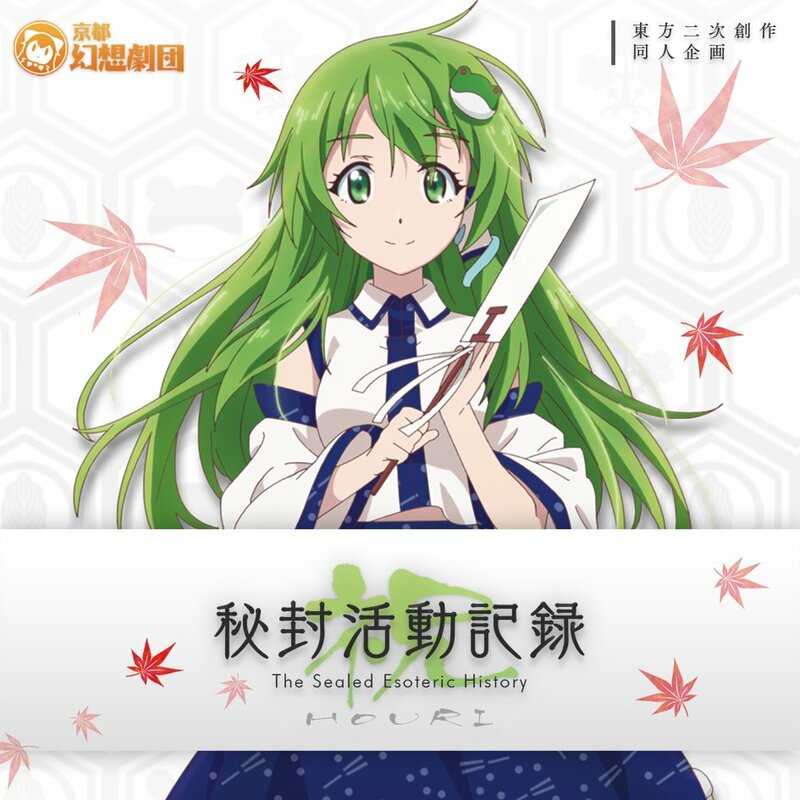 Keine is featured on the album jacket. I prefer Maika in Hatsunetsumiko’s more than FELT. In FELT, her voice is so plain, it doesn’t give out anything much. The EDM instrumental track is a highlight too. I wish I could listen more to Tim Vegas’ instrumental arrangements. But let’s get to the main thing. 聲ナキ詩, a soft and calm song, based on “Plain Asia”. That’s probably my favorite track in the album. Overall, it’s a neat album. Original versions for 緋色, 鳥居の向こうの夢蒔絵 are released in Yuuhei’s newest album「瞬間エヴァーラスティング」. HEAVEN is released in Fractal’s 「オブリヴィオン」. This is a high quality release! The original version of 華鳥風月 has already been so soft and had an ephereal quality, but the orchestral version is over the clouds. This is 10/10. As for HEAVEN, I couldn’t realize Lunate Elf. Usually I can realize the original themes from Yuuhei and Fractal quite fast… Miya’s voice for the song is outstanding. At first, I prefer Riza’s voice more than her. I think she did great in this orchestra album. Toa has become my new favorite vocalist! I like her fashion style. Her voice reminds me of Kushi (Φ串Φ). Toa’s voice is warm and deep, quite opposite to senya. Overall, this third collaboration album will be a great one. I’m having high expectation for the full release!! This CD might accompany with the newest episode of The Sealed Esoteric History. 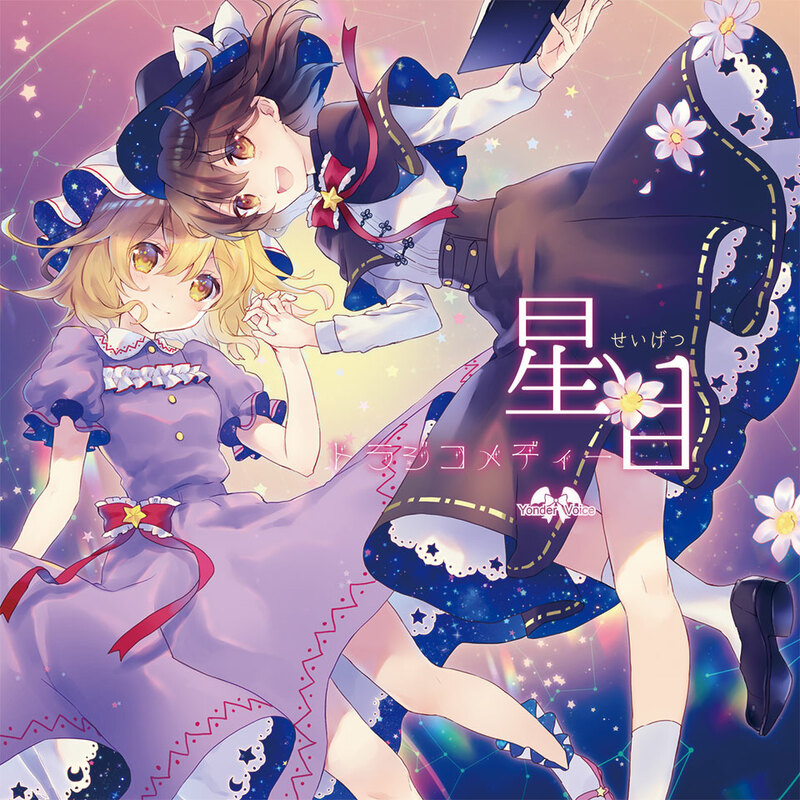 This time Yonder Voice features Renko and Maribel on their CD jacket! When I first saw the illustration, it reminds me of TUMENECO – a circle often makes RenMari music. It turns out that the first track, 星月トラジコメディー, is a collaboration between 瑶山百霊 (Yaoshanbailing) and yukina (vocalist of TUMENECO). I prefer Anzu Sora’s version for 玻璃の揺籠. It’s more emotional than Yaoshan’s version. 決別の旅 and 星空の花束 are the old tracks from their previous album. They are also the opening and ending theme for the first episode of The Sealed Esoteric History. I am quite a picky person when it comes to Hifuu-related tracks. Hopefully, the whole album will be great. Say yay to Shinra~ Bansho~. I love their previous album in RTS14. It’s a nice album to enjoy. So let see how this one would go. This album, we don’t have Mie (vocalist for GET IN THE RING). And wait, Ayo sings for GET IN THE RING? ticat is the new lyricist for the circle! He was a Shinra-Bansho’s fan at first. His lyrics are great in ラピスラズリの夜に. It’s nice to see more from him. As for the crossfade, the first song is so cute. Ayaponzu*’s voice is perfect for the song!! The album mostly has old tracks. Releska told me that some of the tracks were previously featured in limited albums/singles. Yay. This album might be the end of what everything we have been through… or the continuation? Because the contents are linked to his previous albums (密 -hisoka- & 夢 -utsutsu-). All of my speculations, thoughts about the album are all in the translated announcement post. Please check it out! Because I’d end up talking a lot about RD’s newest album so I always make a seperate post just for it. As you take a very, very close look at the kanji in the album cover, you’d see something very suspicious…! The faded traces close to 「音」would become「億」(as in 記憶 (kioku)/memories). Another circle from RD. This circle makes original tracks. I’ve heard some songs in this circle before and it’s great. Something that belongs to RD but off-Touhou. Welp, I think the -to the beginning- series has ended. A new series has started? Stack wrote all the lyrics for this album. I’d read her lyrics for other Touhou characters, so I’m curious to see what concept she had for Renko and Merry. The arrangements in this one is catchier and better than previous albums. Akatsuki is going up. A RenMari album? Neh, that’s fine with me. The crossfade is 7/10 in my opinion. However, I’d like to explore the whole thing when this album is released. This is an album to look at Stack’s previous highlighted song. The album also has new songs. Many of them are the songs that I haven’t listened to. The song based on Yukari and Chen’s tracks is nice. This album gave me some second thoughts about the tracks I have skipped previously. I’ll take this album seriously. I’ve missed so many great stuff! If the album is named “season 1”, we can expect a season 2 or 3 in the future. I misjudged this album when I saw the cover. At first, I was like… ‘Meh, it’s everyone’s favorite strongest tanned ice fairy’. But actually, the crossfade is ON POINT. Highlighted tracks: regalia; 焼痕煉黑、冷艶ノ絶; Secret; 否; Faith,Faith; Doremy,love so sweet! Konpeki continues with a MoF arrangements album! I honestly it’s hard to find a song would go well with あまろ (Amaro)’s voice. 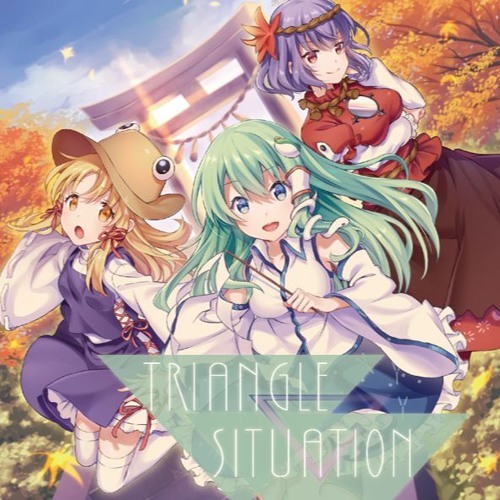 The PV for TRIANGLE▽SITUATION has very good graphics and effects but not the quality of the vocalist. It quite lets me down, meanwhile ANSWER//TALKER is a good one. The second half of the crossfade is decent. The new vocalist, 美津紀, really delivers something in the song. Her voice is warm. I love vocalist with warm voices singing ballad or soft songs. 謎の人物K (Nazo no Jinbutsu K, but I’ll call her Nazo for short) is still fine in this album. It suprises me that her cute voice in the first track. I’m crossing my fingers for the lyrics of my personal favorite tracks. There’s a 709sec. compilation album called REVIVAL BEST III; a live DVD for “MAGMA LIVE 2017” back in February 18th, 2017. However, I’ll only feature 強敵 -LAST BOSS- in this post. I was expecting something new like -KONPAKU- or -KOCHIYA-… Oh well, -LAST BOSS- is fine, actually it’s great. I love last bosses’ themes a lot. The Miko’s track is an instrumental track… That’s a sad thing… They haven’t uploaded the crossfade yet. 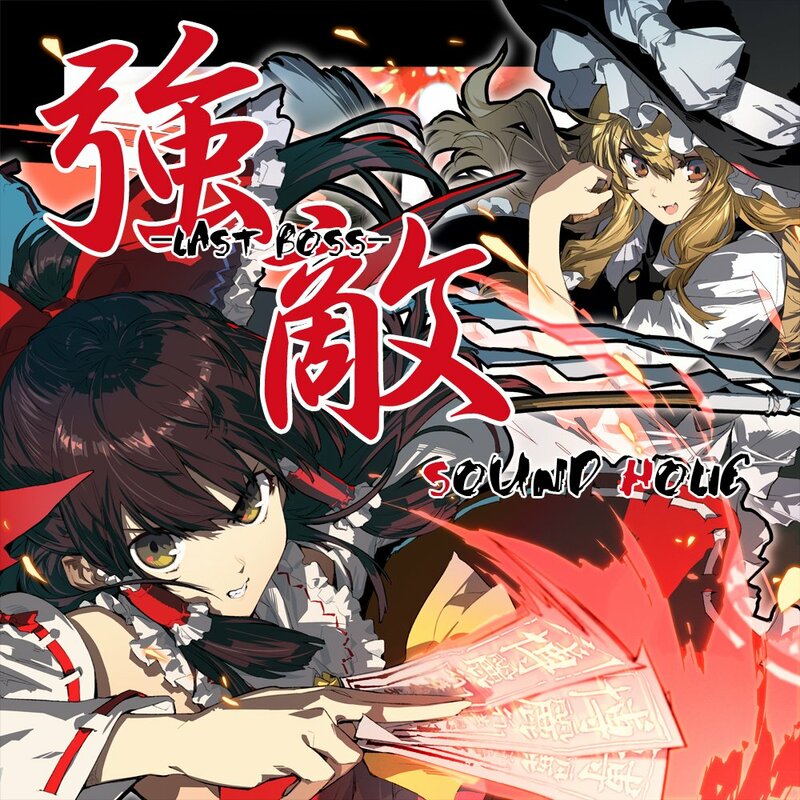 The album features the last bosses in the Touhou game. I mostly like them all and up to now, I can’t decide which one is my favorite… Overall judging, I think the vocalist arrangement is quite okay… A strong voice like YURiCa can go well with a Shinmyoumaru or a Kanako track. We’ll have to wait for the crossfade to come out. Touhou Jihen forgot to sign up for their booth in C92 and they decided to collaborate with someone. [tweet] It’s マッカチン企画! Six songs in total with two new songs from each circle. I like the first half of the crossfade. In their official website, there are lyrics scans. Well, I hope Jihen will release an album for Winter Comiket in compensation for this. It’s a collaboration. I burst into tears when I saw their crossfade. They released it a little late. I thought they would have a break or something… It’s worth the wait, honestly. They don’t name the album “Selected Works” for no reason. “THE SELECTED WORKS OF TAMAONSEN 4” is the forth volume of Tamaonsen’s best songs compilation. As I’ve once mentioned, an album like this can give you second thoughts about songs you have missed or skipped in the past. 幽々しき桜; Q; モノクロームレインボー have their own instrumental versions back in 魂音泉 空オーケストラ ~たまオケ~ ３ (released in C91). There are some good tracks. Maybe I’ll try to translate them into Vietnamese. Gimme motivation!!!! I’m assuming that 零 (rei) will be the jacket illustrator from now on, instead of 萩原 凛 (Hagiwara Rin)? Well, anyone will be fine for me. rei is a super talented illustrator. I love her artwork so much. For the crossfade, it’s a roller coaster… So hard to decide which one I like most because each track is good in a different way. I’ll notice the forth track, Someday In Summer. There’s a part where Romonosov? called ytr is “ytr-san” and ytr called him “Romo-chan”! It’s my personal favorite part in the crossfade. Colorless World II is based on “Broken Moon”. The first version is released in she saw and based on Desire Drive. I need more instrumental tracks… The last song is a vocal track based on Desire Drive!! There’s a female vocalist (yayy). Her name is あき. I’d like to see how her voice would go with the male vocalist of Tamaonsen! I have a soft spot for Jazz music. This album is based on original sound tracks from Ten Desires. Ten Desires is my favorite Touhou game, I’ll have my eye on the full album. 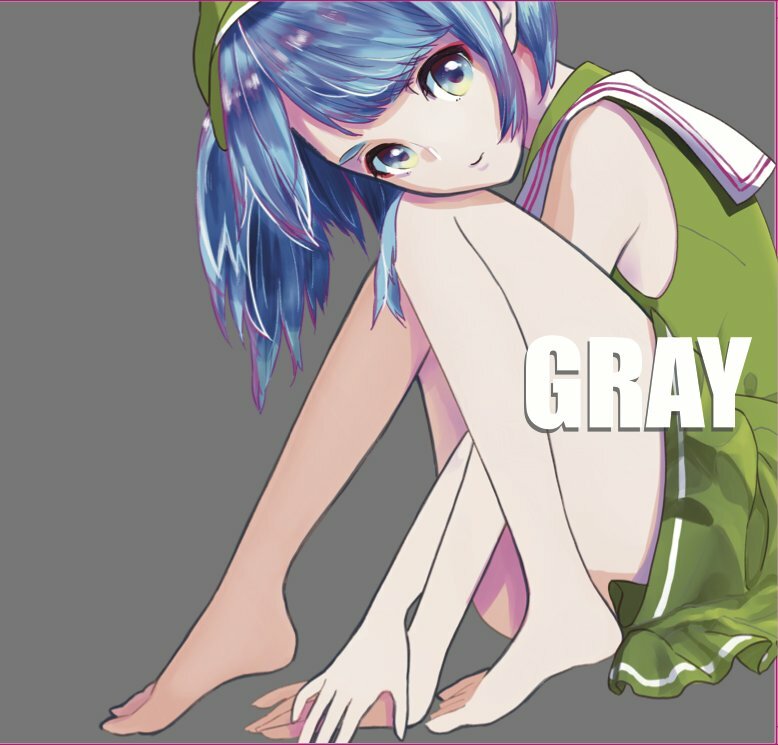 And why do I have the feeling that Tsubameyado illustrated this album cover…? To be honestly, I can’t decide which one is my favorite song because I like them all… I tried to sort out which one stands out the best. There’s a new vocalist, mihomi. Her voice is nice. I’d like to hear more from her. Would she be an official member of ALST in the future? I hope that it would happen. Continues with the fifth track, Seashore on the moon, I’m not a fan of Nanahira but that track is a catchy one and I think it stands out the best. The instrumental tracks are good, very high quality. The last track is a remix of the forth track. Minoshima, Tracy and Syrufit. In conclusion, a good one to put your money on. (Another (?)) nachi album! The illustration for the jacket is so beautiful. It reminds me of Sakura Horizon by nachi. And yes, it’s also featured in this nachi compilation album. 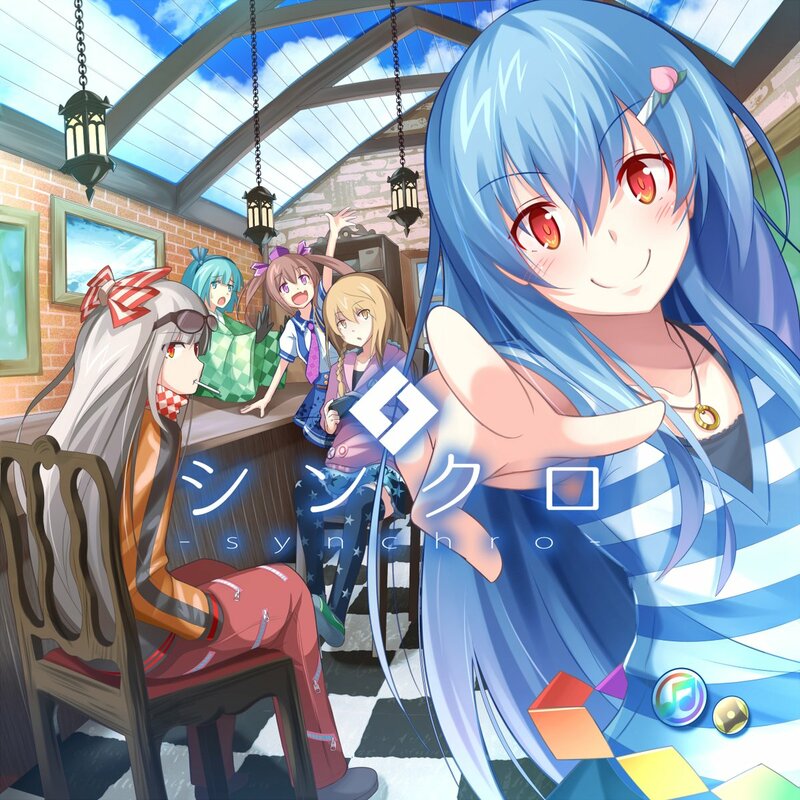 This album mostly features songs from Alstroemeria’s old albums. It’d be nice for me to check the old tracks from her. The two Yuyuko-related tracks are just legendary. I know those two when I first knew Touhou. And yeah… she might be my second favorite vocalist from ALST. This circle was found by YURiCa/花たん(Hanatan) and 隣人 (Linjin from ZYTOKINE/CYTOKINE). Their first album 『椿』 (tsubaki) was released in Reitaisai 14. New circles are now focusing on making PVs, for example, Konpeki Studio. Making PVs is a good way to promote their name. Well, I’m completely fine with it. I know YURiCa from SOUND HOLIC’s albums. I like her strong and deep voice. She’s running a new circle! I missed her debut album in RTS14, but this time, I’ll try to discover them both. Yay! AdamKadmon! 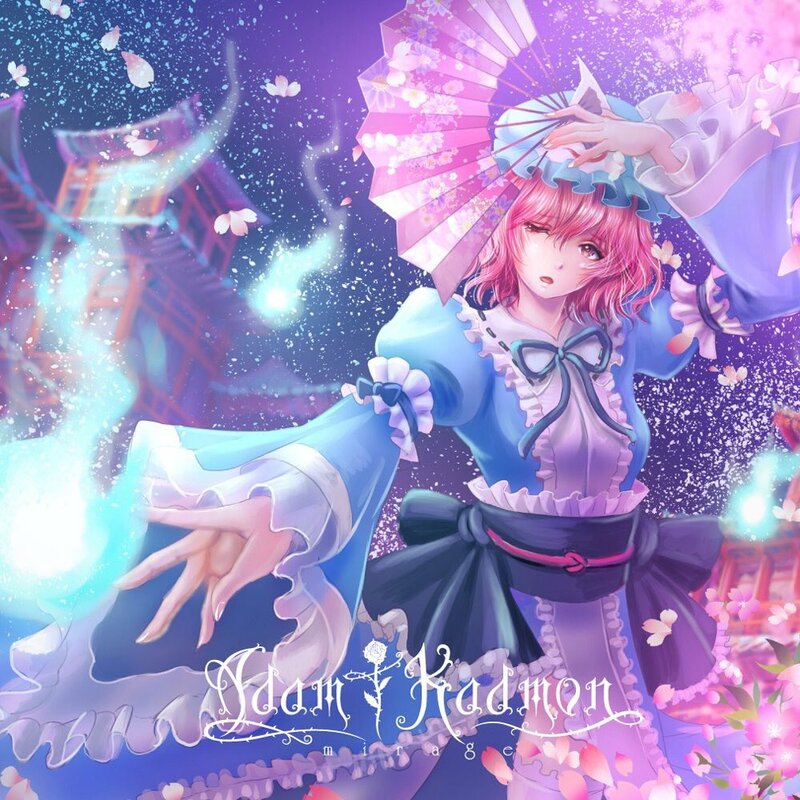 A gorgeous Yuyuko cover yay! They released an album in RTS14, but it’s a RenMari album and I somehow skipped it. I’ll focus on this album this time. FELT’s crossfades are always good at start. I hope this time I won’t give up on their album so soon. The Tenshi track is a good one. It feels like an anime opening for me – quite refreshing and uplifting. Three English tracks, one of them is a remix from World Trick. When I listened to Phantom for the first time, somehow I thought the track was in Chinese… Importantly, that’s the track I want to pay more attention on. IN THE RAIN remix is way better than the original version released back in Fluster Escape. I prefer the new version more. There’s also a good piano arrangement from MZC. Some quick words before I’ll talk about the newest album. In this Comiket 92, Liz Triangle will officially disband. Shinra-Bansho will be kaztora’s main circle. lily-an’s illness is not going well and she can’t cooperate with the other members. She’s the main vocalist and the main designer for the circle. It all turns out to be like that. For more information, please have a look at lily-an’s tweet. I had listened to their debut album 紅KURENAI before. 瑶山百霊 (Yaoshanbailing) also participated in the debut album. It was pretty plain and one-color. I was expecting Napoleon’s voice to be impressive. Honestly, it disappointed me. And yeah… I didn’t take a look at the second one, 妖 – AYAKASHI. 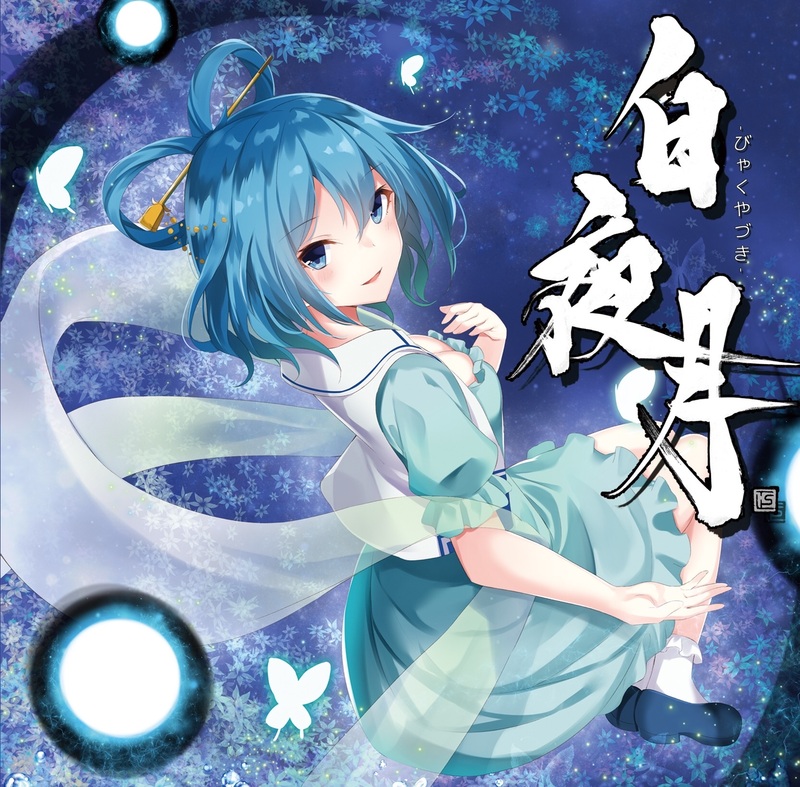 However, this third album 空蝉ノ響 convinces me once again! Everything is better than the first album (Well, everything has its first chance right?). This album really shows each member’s talent. Napoleon and Renka started out as cosplayers. They are very pretty and their cosplay photos are beautiful! For the other members, I don’t know about much, but I’ll soon discover them. I saw this randomly on Nico Nico and decided to take a look (because I saw Seiga). I’ve never listened to any of this circle’s song. It’s a Ten Desires album! This is their second album. The overall crossfade is nice. It matches my music taste. Well, I’ll have my eye on the full release. This artbook is a commentary from Hanada Hyou’s perspective about RD’s previous album. This one features 求 -motome-, 喩-tatoe-, 密 -hisoka-, 掲-kakage- and 夢 -utsutsu-. Hanada Hyou has been the illustrator for RD from the beginning. 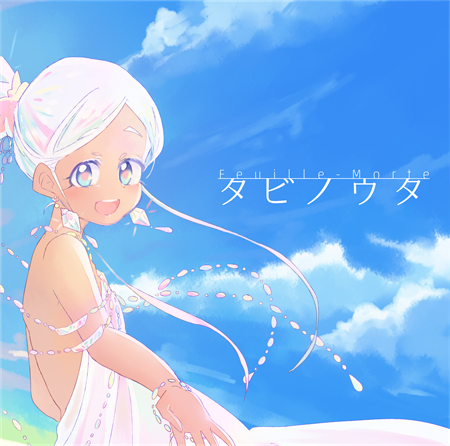 Her artwork for -utsutsu- the way she uses pastel colors are amazing. I might buy this product. -hisoka- and -utsutsu- are the “important” albums from RD; and I’d like to see Hanada Hyou’s comments. Since this one is released in C92 and I have mentioned it above, I decided to include in this post. Through out nine episodes, nothing changes much. Yuuhei Satellite is responsible for the Original Sound Track. Anime episodes from Manpuku Jinja are non-dubbed so anyone on the Internet can have an attempt to voice the episode. Actually this time, maybe Toa (the new vocalist of Yuuhei Satellite) would perform the Ending theme? Just wait and see. This is the middle part of the “Eternal Night Incident”. You can expect the third and last part. I wonder which incident will be featured after this? Because at the end of episode 4, there’s a scene which Shou and Nazrin decided to free Byakuren from her seal. However, in episode 6, there’s a spoiler for Mountain of Faith. The chronology in the anime series is mixed up. We aren’t sure what Manpuku Jinja is planning to surprise us…! “This is an RD event”. Yonder Voice performs the OP theme, meanwhile RD takes care of the ED theme. Like, when I first watched the promo with the RD’s song in it, goosebumps are all over me. Kyoto Fantasy Troupe is getting better in everything. Especially the animation, it’s way smoother than the first episode. The color scheme is bright too. And importantly, the cast for this episode. They are very well-known voice actresses. Renko is voiced by Eri Kitamura and Kana Hanazawa is the voice of Maribel Hearn. My childhood grew up with Hanazawa. She’s a bright talent! Judging overall, everything for this fanmade episode is ready and will not let us down. 四面楚歌 (Shimensoka) is known for publishing works related to RenMari. At least that’s for me. Last year Winter Comiket, they released a novel called “MERRY BAD END”. This time, there will be a RenMari novel too. Instead of illustrations, they used a cosplay concept. The photos are beautiful. There’s a member – uhimaru. She’s a talent in Touhiu handmade bracelets and a very skilled photographer. As usual, RD also participates in this project. He’ll probably compose some songs. Vocal or instrumental, we aren’t sure about that. However, I’ve already seen some high quality signs. We cannot forget ZUN in this grand event! 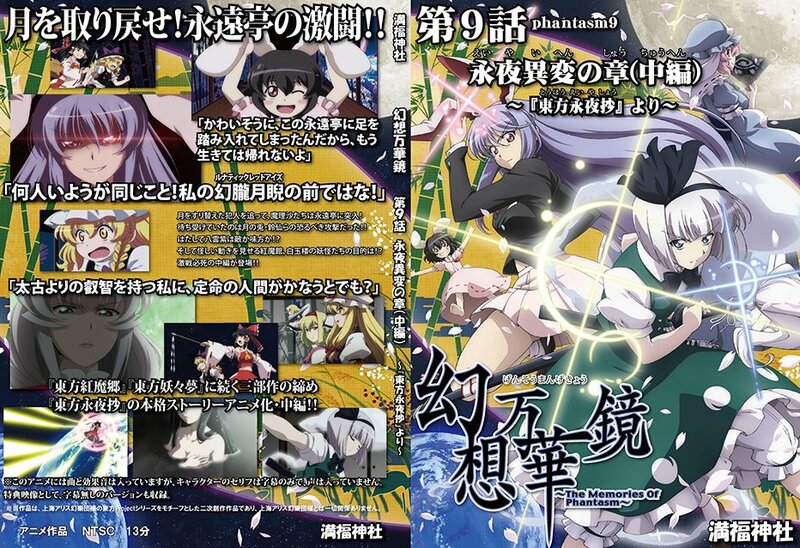 It’s the full version of the latest Touhou game! The cover has 3 bosses! I can’t wait for the new characters, new OST and how this four seasons concept would go!! Before ending this post, I’d like to introduce Releska’s newest albums. “The Esotericist is Missing” was released in Redditaisai. This album is a remaster version of the one he released in C88. The newest album, Petite Symphonie, is set to be released one week after C92, in order to have more time to focus on it. There’s a uniqueness in Releska’s music that currently I can’t find a word to describe it. “Mesmerise”, maybe? Remember to support him on Bandcamp! And yes, after I’ve read Releska’s Roundup post, I found it very interesting and some of his opinions are similiar to me. You might want to check it out!